This must-read book packs a one-two punch. One storyline is a brilliant kid’s persistence (despite 192 letters of rejection) in creating an inexpensive early-detection test for one of the world’s deadliest cancers, and winning – at 15 – the country’s most prestigious science award. The other story is that of a middle schooler’s growing awareness that he’s gay and overcoming vicious bullying. Each story is remarkable, and in this compulsively readable book the whole is even greater than the sum of its parts. Featured in the 2018 movie Science Fair! 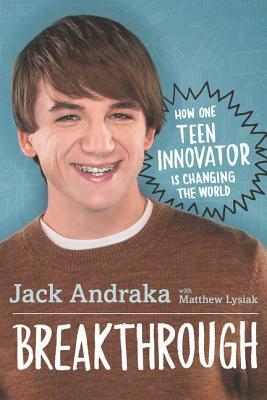 In this acclaimed memoir, teen innovator and scientist Jack Andraka tells the story behind his revolutionary discovery. His account inspires young people, who he argues are the most innovative, to fight for the right to be taken seriously and to pursue our own dreams. Do-it-yourself science experiments are included in each chapter, making Breakthrough perfect for STEM curriculum. But above all, Jack's memoir empowers his generation with the knowledge that we can each change the world if we only have the courage to try. Jack Andraka was just a fifteen-year-old Maryland high school student when he invented an inexpensive early-detection test for pancreatic, ovarian, and lung cancers. Now, at eighteen, he has already won the 2012 Intel ISEF Gordon E. Moore Award, the 2012 Smithsonian American Ingenuity Youth Achievement Award, first place in the 2014 Siemens We Can Change the World Challenge, and the 2014 Jefferson Award. He speaks to audiences across the globe about his personal story, his research, LGBT issues, and his ideas for STEM education reform. He has been featured in several documentaries, including Morgan Spurlock's You Don't Know Jack, as well as countless radio, newspaper, and magazine articles. Matthew Lysiak is a nationally recognized journalist and a former reporter for the New York Daily News. He is also the author of Newtown: An American Tragedy and has appeared as a contributor on the Today show, MSNBC, Fox News, CNN, and countless other national and local media outlets to discuss his work.